What’s the story with the new Star Wars movie and Ireland? It’s true – the Millennium Falcon has been sighted in Ireland. The cast and crew of Star Wars: The Last Jedi descended on Ireland’s Wild Atlantic Way to shoot in numerous locations from Donegal in the northwest, down to Clare and Kerry and finally West Cork! Malin Head was the filming location in Donegal. Should the Star Wars connection draw you in for a visit, there is plenty of hospitality to enjoy after a long day of exploring. Mark Hamill, (Luke Skywalker) surprised locals during filming of the saga’s latest installment by showing up in one of the area’s cosy pubs – Farren’s Bar. Heading southwards, the Wild Atlantic Way’s Loop Head in County Clare is where you’ll find some pretty stunning scenery! A dramatic lighthouse has perched on the cliffs here since the early 18th century and, while it was temporarily closed to the public during filming, guided tours are available from March to November – you can even stay here, should you like particularly stunning accommodation! And now to the place that utterly entranced the Star Wars team as they searched for locations with a suitably otherworldly aspect. 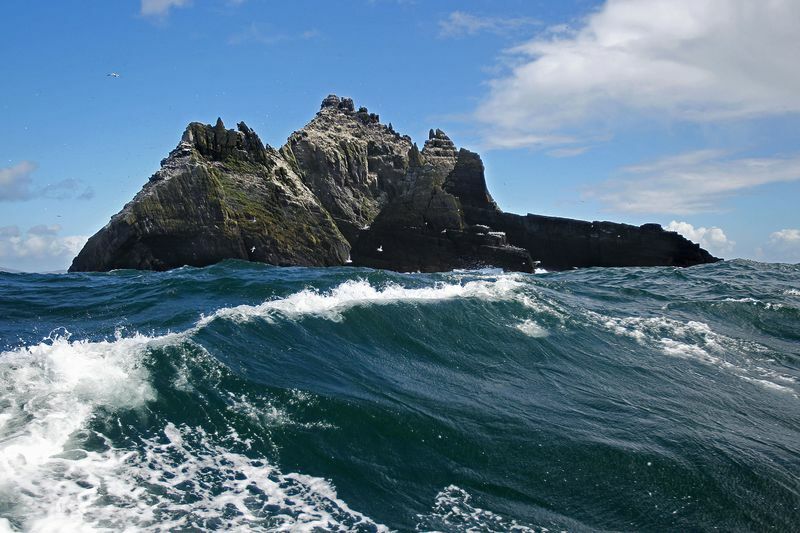 Skellig Michael, an island off the County Kerry coast, was already well known for its 6th century monastic settlement as well as for its jaw-dropping beauty. But since it was immortalised as the island hideaway of Luke Skywalker in Star Wars: The Force Awakens and The Last Jedi. Boat trips to or around the island are seasonal and weather-dependent – and the views from the mainland are pretty spectacular, too. Finally, to County Cork, where filming took place on Brow Head and the local town of Crookhaven buzzes with tales of the cast and crew. If you’re here, don’t miss the Mizen Head Visitor Centre for a glimpse at Ireland’s maritime heritage and views that are out of this world! Any other community members out there with ideas on how to explore the Star Wars locations on Ireland’s Wild Atlantic Way? I had no idea this even happened. Pretty cool information! My brother is a huge Star Wars nerd so I will have to share this with him. Are there any sets left from the movies, such as the beehive huts from Skellig Michael which were used for close-ups? Are there any information about the places where they filmed the movie more than in the article about Star Wars on the Wild Atlantic Highway, such as maps etc.? Most of the locations used during the filming were on private farmland so all props and buildings were removed after filming! There is some more information on our main website on Star Wars in Ireland that you may wish to take a look at. There are plenty of links in the article to more information pages, so well worth the look! Are you planning on undertaking a tour of the island of Ireland to see some of the filming locations?